Pre-Kindergarten through third grade students meet for Spanish twice a week. By the end of third grade, students possess an impressive vocabulary, ranging over a variety of topics including food, family, clothing, community, animals, colors, parts of the body, classroom objects, the days of the week, and the months of the year. Students are able to say the Spanish alphabet and count to sixty. Fourth graders go on to learn the basics of written and spoken grammar, yet still attend class twice per week. Students in fifth through eighth spend more time in the Spanish classroom, as it is now considered a core subject for them. 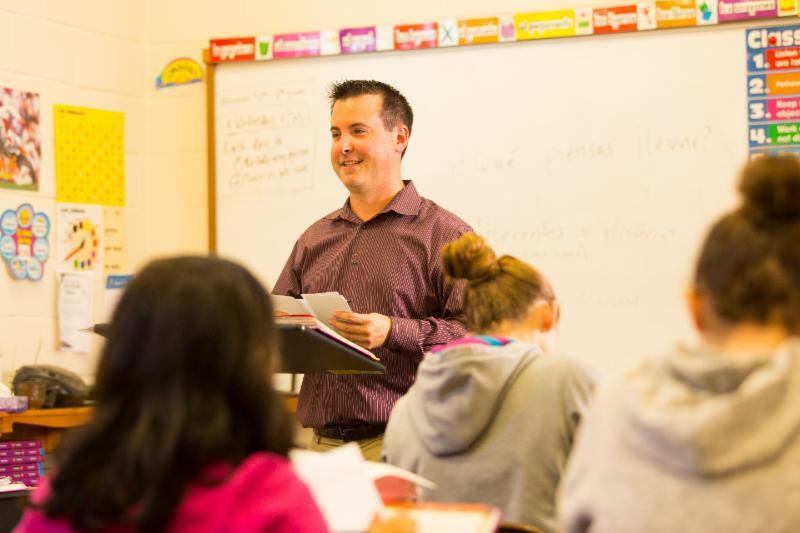 Students build an extensive vocabulary and are able to communicate in the three major tenses (present, past and future) in Spanish, enabling them to test into higher levels of Spanish in high school. Students may test into our Accelerated Spanish group. Latin is alive and doing well at Westfield Friends School! The program begins in fourth grade with an introduction to culture and daily life in ancient Rome. Students develop an appreciation for Roman contributions to architecture, language and the government. The course incorporates mythology and the impact these stories have on art. Students are able to study mythology in art with their teacher. Students in the fifth and sixth grades develop language skills, and inflections through various activities geared to acquainting them to traditional grammar. Students who complete this program in seventh and eight grades will have completed the equivalent of a ninth grade course. With teacher support, students compare their knowledge of Latin grammar to modern spoken languages. Students are eligible to participate in the National Latin Exam. Students are asked to participate in the Philadelphia Classical Society Annual Latin Forum. Students are able to express their creativity and ideas regarding the ancient world, by choosing from a variety of mediums. Students use various texts including Ecce Romani! and Jenney’s First Year Latin, as well as material on several websites. Students are able to complete assignments through these sites and submit them to their teacher.